Frederick Dawson was the son of James and Mary Dawson. Frederick was born in Shankill, Belfast about 1885. Frederick worked as a dairy manager. Rifleman Frederick Dawson was serving with the 9th Battalion of the Royal Irish Rifle when he was killed in action in Belgium on 7th June 1917. He was 32 years old. 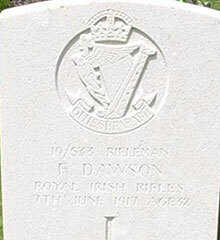 The CWGC records Rifleman Frederick Dawson as the son of James and Mary Dawson, of Caledon, Co. Tyrone. 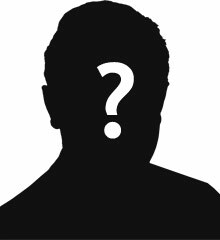 He was also the husband of Anna Helen Dawson (nee Hughey), of 93, Cavehill Road, Belfast. Spanbroekmolen British Cemetery is located 8 Km south of Ieper town centre, on a road leading from the Rijselseweg N365, which connects Ieper to Wijtschate and onto Armentieres. From Ieper town centre the Rijselsestraat runs from the market square, through the Lille Gate (Rijselpoort) and directly over the crossroads with the Ieper ring road. The road name then changes to the Rijselseweg. On reaching the village of Wijtschate the first right hand turning is the Hospicestraat leading onto the village square. The Wijtschatestraat leads from the village square, 1.5 Km beyond which lies the Scheerstraat on the left hand side. The cemetery itself lies 500 metres along the Scheerstraat on the left hand side of the road.